I guess it should come as no surprise that sleeping in has a way of really shortening a day. It was worth every minute, but man, I don’t know where the day disappeared to. We didn’t do all that much. There was a brief trip to the grocery store in town for some items to help Cyndie do her special magic in the kitchen. 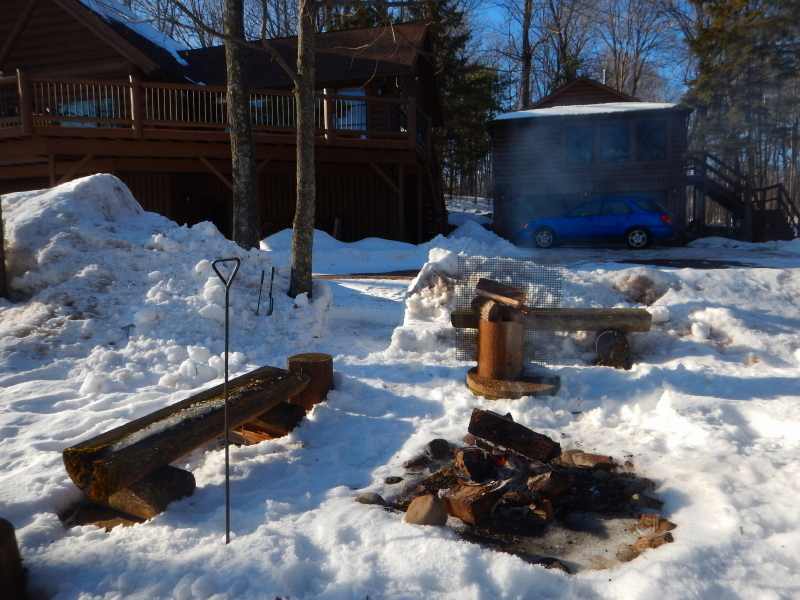 While she was preparing things inside, I moved some snow around outside, digging a path to the fire pit so we could make a cooking fire. The grill was stowed away somewhere, so I suggested we just cook over a wood fire. That meant I got to manage two fires at once. I built a fire in the fireplace, in addition to the one outside. That’s about all I did, between periods of eating things Cyndie prepared. Late in the afternoon, our friends Barb and Mike arrived to help us tend the fires and eat food. We did well at both. The short day was sparked to additional heights when we received a surprise visit from our friend Jane and her pal, Eric, who stopped over to say hi. What a joy. If there is ever any doubt about what matters in life, experiencing the pure delight of time with treasured friends, and the energy of meeting someone new, does a lot to make it clear. I’m so happy the day wasn’t too short for that.